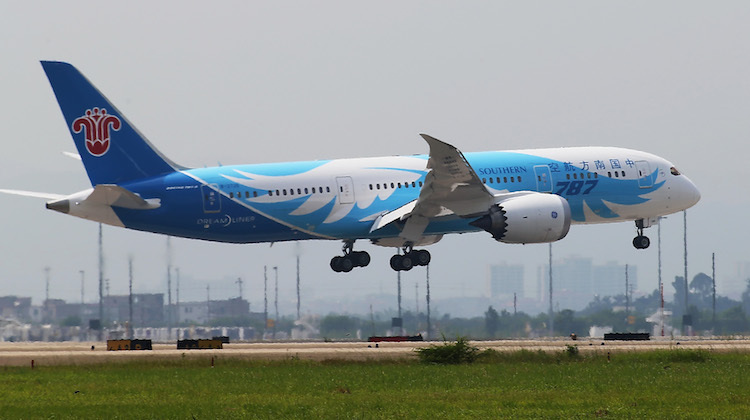 Perth Airport will receive its fourth Boeing 787 operator in April when China Southern deploys the Dreamliner on its thrice-weekly service from the airline’s Guangzhou hub. China Southern said on Thursday it would replace the Airbus A330-200 currently being used on the route with a 787-8 configured with four first, 24 business and 200 economy class seats from April 1. The start of China Southern’s 787 flights to Perth would follow Air New Zealand, Thai Airways and Scoot as airlines with service to the West Australian capital using the new generation aircraft. Meanwhile, the Skyteam alliance member was scheduled to move its Guangzhou-Melbourne flights to double daily from July 1, from 10 times a week currently. And the airline’s Guangzhou-Brisbane service was slated to add an extra two flights a week to become a daily offering after June 23.